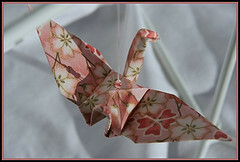 A few years ago, I got the itch to do a little origami with the kids. Washi papers are just gorgeous, and lovely to fold, or even just to look at. 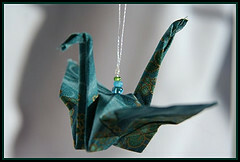 After a while I thought it would be neat to try to make some ornaments out of the cranes we were doing, but wasn’t sure the paper would hold up. So I went through the exploding fabric stash looking for the Japanese fabrics I knew I had and started folding that. The fabric by itself wont hold the folds, but with a little fabric stiffener it works beautifully. 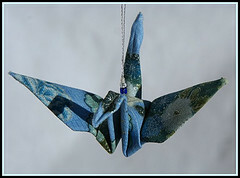 We gave our flocks of cranes away, stung on string and each with a little bead, for Christmas and Hanukkah gifts. They were a hit, so I just kept on going. I’ve been experimenting a bit using my own hand dyed fabrics, but that isn’t going as well. The cottons I did last summer are too thick, and there needs to be a little more experimentation on the silk stiffener. Too much and you lose the sheen and inherent qualities of the silk, too little and it’s just floppy. 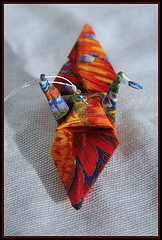 But in the meantime, here are a few of the cranes that have been done for a while. This next one is actually not a Japanese print. It was a butterfly fabric from Hoffman, for he Hoffman challenge a few years ago. I bout it specifically for the origami.